In our previous articles, we have given CA Final New Syllabus for May 2018 and Nov 2018 and How to Convert From CA Old Syllabus and CA New Syllabus. Today we are providing CA Final Group - 1 and Group -2 question papers of previous exams I;e last 10 attempts of Financial Reporting, Strategic Financial Management, Advanced Auditing and Professional Ethics, Corporate and Allied Laws, Advanced Management Accounting, Information Systems Control and Audit, Direct Tax Laws and Indirect Tax Laws. Before downloading CA Final question papers read few subject based tips, which we have given below. Financial Reporting- Never ignore or undervalue Accounting Standards. It is part of 50-60 marks paper in FR (paper-1) and Audit (paper-3). Strategic Financial Management (SFM) - Try to solve the question from your own, not audit your notebook otherwise, you will not be able to solve it at the time of Exam Paper. In addition, one more thing to remember, give equal weight to each topic, it is on ICAI to ask anything and in any manner (weight of topic) is not fixed. Auditing- Try to remember topic pointwise and present it in pointwise manner to score good marks. Corporate and Allied Law- Pay equal attention to allied law too and remember section number and interlinking of the section to score well. Advanced Management Accounting (AMA) - Make sure that you solve each question from your own and solve practice manual too. Go through development in AMA, these small topics carries the handsome amount of marks in the exam. ISCA- Again Answer in pointwise manner and to the point only. Never try to answer a question, which is not known to you in exam sheet at early pages. Answer it on the end. Indirect Tax- Topic wise clarity of provision and a common topic is required. Pay attention to valuation rules, case laws and amendment carry high weight-age in the exam paper. Solving the question paper in the examination situation will help you, not only in time management but will also give you the confidence to attempt different types of questions in the examination. So here we are providing, CA Final Question Papers of previous exams. Download below! ICAI will be conducting CA Final exams from 1st November 2017. Therefore, we will update download links of CA Final Nov 2017 question papers in the evening of respective exam dates. CA Final Question Papers May 2017 - Click on the links to download CA Final question papers May 2017. Download ICAI CA Final Question Papers Nov 2016 - Click on the links to download CA Final question papers November 2016. 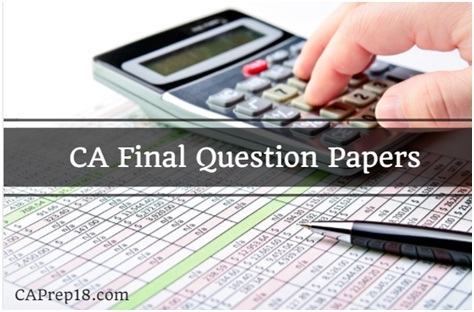 CA Final Question Papers May 2016 - Click on links to download CA Final Question Papers May 2016. With the help of CA Final, previous exams question papers with solutions, you will get an idea about ICAI exam pattern. Do not neglect preparation of these question papers with suggested answers. Share this article ” Download CA Final Question Papers Nov 2017 to May 2010 ” to your friends, who are going to write CA Final exam in May 2018 ! !